Wilfred Edward Salter Owen was born in Oswestry, Shropshire, United Kingdom. Wilfred took a four-year course as a pupil-teacher gaining not only a good grounding in French, English Literature, the earth sciences and other subjects, but also but also the experience of teaching children from very poor homes. Studying Wordsworth and Keats made him long to be a poet and he started writing verse. In 1913 he became a teacher of English in Bordeaux, France, but returned to England in 1915 yo join the Artists' Rifles, a prestigious officer training unit. In June 1916 he became a second lieutenant in the Manchester Regiment. In January 1917 Owen arrived on the Western Front, most of his later poems such as 'The Sentry' are based on his experiences during the next four months. Conditions were appauling with bitter cold, incessant rain, deep mud, obliterated trenches and constant shelling. He was blown into the air by a shell while asleep and sent to Craiglockhart War Hospital in Edinburgh. Here he became friendly with poet Siegfried Sassoon. 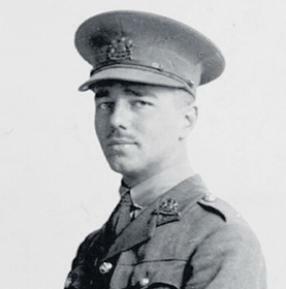 Until he met Sassoon in August 1917, he had not written any of the poems for which he is now famous, his few war poems had been patriotic and heroic. Owen's thoughts and style changed dramatically, by October he was writing poems such at 'Dulce et Decorum Est'. In November Owen was sent on light duties to Scarborough. He began to break away from Sassoon's influence, reading other wartime poets such as Robert Graves and Wilfred Wilson Gibson and reflecting on his 'duty' as a poet. Like Sasson, he wanted to speak for the troops, but his strong allegiance to the great Romantics gave him a wider view. Some of his 1918 poems 'Insensibility', 'Strange Meeting' and 'Spring Offensive' are among the greatest poems written about war. In spring 1918, Owen was sent to camp at Ripon to get fit for active service. At the end of August he returned to France. He took part in the breaking of the Hindenburg Line, winning a Military Cross. On the 4th of November, in the last battle of the war, he was killed while his battalion was trying to cross the Oise-Sambe canal at Ors. He is buried in the village cemetery. "Anthem for a Doomed Youth"